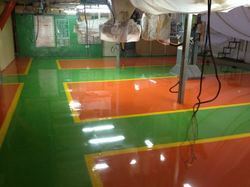 Providing you the best range of epoxy floor paint with effective & timely delivery. Backed by the continuous supports of authorized vendors, we are exporting and supplying a commendable range ofEpoxy Floor Paint. Our epoxy paints are known for their excellent adhesion, chemical and heat resistance, good to excellent mechanical properties and very good electrical insulating properties. Provided paint finds immense applications in schools, colleges, residential areas and related sectors. In addition to this, offered paint is obtainable in the market in number of colors at cost effective price range.